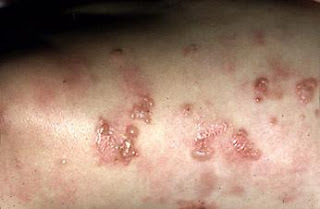 Dermatitis herpetiformis is an autoimmune blistering skin disorder associated with coeliac disease. It is caused by deposition of IgA in the dermis. Despite its name, DH is neither related to nor caused by herpes virus: the name means that it is a skin inflammation having an appearance similar to herpes. The age of onset is usually about 15-40, but Dermatitis herpetiformis can also affect children and the elderly. Men and women are equally affected. Most people with dermatitis herpetiformis have damage to their intestines from eating gluten. But only some have intestinal symptoms. Diagnosis: Dermatitis herpetiformis is often misdiagnosed, being confused with drug eruptions, contact dermatitis, eczema , and even scabies. The diagnosis can be confirmed by a skin biopsy: direct immunofluorescence shows deposition of IgA in a granular pattern in the upper dermis. 1. An antibiotic called dapsone is very effective. 2. A strict gluten-free diet will also be recommended to help control the disease. Sticking to this diet may eliminate the need for medicines and prevent later complications. 3. Drugs that supress the immune system may be used, but are less effective. Prognosis: The disease may be well-controlled with treatment. Without treatment, there may be a significant risk of intestinal cancer.